Battle of Grudziądz was a military engagement between German and Polish forces during the Invasion of Poland in 1939. It started on September 1 and ended with a German victory on September 4. German historiography has dealt with the fighting in the larger context of the Battle of Tuchola Forest. The border city of Grudziądz (Germ. Graudenz) contained headquarters of several Polish military formations, as well as several military schools. Moreover, it played a crucial role as strongpoint in order to defend the Vistula River Line and secure the route of retreat of the Polish divisions engaged on the left bank of the river. The town was defended by the Grupa Operacyjna Wschód (Operational Group East) under Gen. Mikołaj Bołtuć with the 4th and 16th Infantry Division, part of Army Pomorze (Gen. Bortnowski). The city was assaulted by the German XXI Corps (Gen. von Falkenhorst) on 1 September. The German 21st and 218th Infantery Divisions pushed back the Polish lines to the small river Ossa, east of Grudziądz. On 2 September Bołtuć lead his 4th Infantry Division in a counter attack the German 218th Infantry Division. Althrough the Polish forces gained some ground, the attack was finally repulsed. 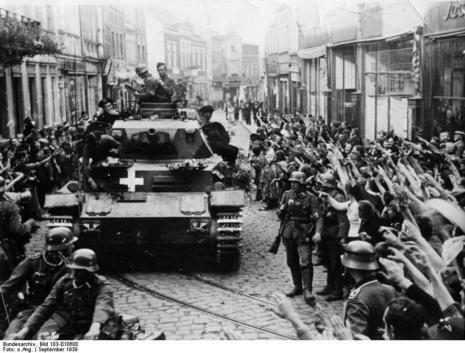 On 3 September elements of the German 45th Infantery Regiment managed to break into the town itself. The Germans held out there until the evening, but had to retreat when the Polish pressure increased. At the same time Bołtuć received news, that the Polish divisions on the western bank of the Vistula were facing defeat and the German forces had already crossed the Vistula in the south. This forced him to pull back his units in order to avoid being soon encircled. The Polish defenders destroyed the bridges over the Vistula and retreated to the south-east. The Germans occupied the city on 4 September. The tension was growing up over East Prussia in that July of 1939. During the diplomatic negotiations between the German and the Polish goverments the armies of Poland were getting gradually ready. On August 21 1939, the 21 ID (Generalleutnant von Both) became under XXI AK (Generalleutnant von Falkenhorst) which in turn was in the framework of the 3 AOK (General der Artillerie von Küchler) under H.Gr. North (Generaloberst von Bock); it was deployed in the Marienwerder area and supply depots were established well camouflaged deep within the forests.